Scores of people on Sunday flocked to San Francisco and other major U.S. cities demanding that Congress boot President Donald Trump from the White House. 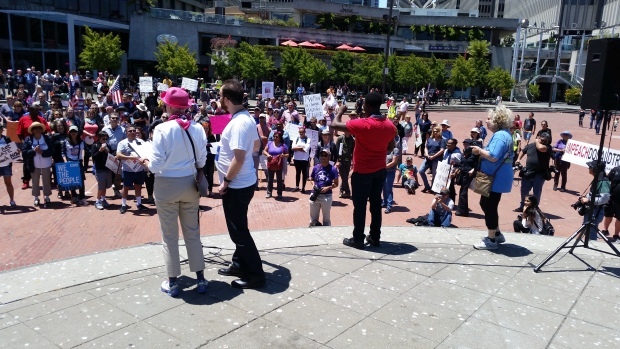 Local independent activists in San Francisco organized the "Impeachment March," which began at Justin Herman Plaza and continued through city streets, with eyes set on furthering the anti-Trump movement. "He's got to go," participant Gary Shaller said. "I'm raising daughters. I work in health care. I have a lot of patients to take care of. It's an unhealthy presidency for a very sick country and we need somebody to make it better." During the march, a continually-growing crowd of people, including those flashing "Impeach Trump" signs pinned to their T-shirts or backpacks, could be heard chanting, "What do we want? Impeachment. When do we want it? Now." Echoes of "No ban, no wall, no way, no fascist USA" also rang out among the demonstrators. Thousands of demonstrators gathered in downtown Los Angeles and hundreds met in San Diego to call for Trump's impeachment as well. People marched in Austin, Texas, from the state Capitol to the City Hall, clashing with pro-Trump demonstrators along the way, while Trump supporters and protesters gathered in New York City outside the Trump hotel, according to NBC News. Three people were arrested in Philadelphia in a dispute between anti- and pro-Trump demonstrators. Week after week, anti-Trump demonstrations of varying degrees continue to pop up across the country as people voice heated opposition to the policies and behavior flowing from the Trump administration. Those speaking out say they won't be silenced. 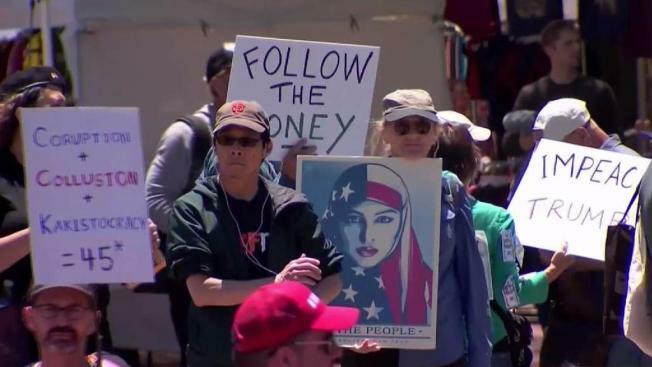 "Every single thing that comes out of this president's mouth, every action he takes is contrary to what I believe, and frankly I've had enough," San Francisco march attendee Mark Ransdell said. The march comes on the same day President Trump tweeted an edited video of himself beating up World Wrestling Entertainment CEO Vince McMahon. But a CNN logo replaces McMahon's face in the edited video. The tweet did not sit well with many of the marchers taking action in the city by the bay. "It's appalling," Kristen Cato said. "Our freedom of speech, our freedom of press is seriously being jeopardized right now." Roughly 1,100 people noted on Facebook that they would participate in the San Francisco march, which appeared to stay peaceful during its duration. An official count of event attendees is not yet known at this time.